Individual of the Month - January! Wow, wow and double wow-wow! 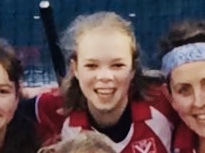 Abi Brooks has been on FIRE since the beginning of the season as she sashayed from Ladies 4s to toe-dipping in the Ladies 3s, building confidence with great performances to earn a spot in the Ladies 2s. No backseat for Abi here....instead she is #smashingit with Player of the Match votes flying in each week. Abi has a GREAT attitude and is absorbing all the learning opportunities available. She is SO deserving of our Individual of the month for outstanding performance....keep it up Abi! !